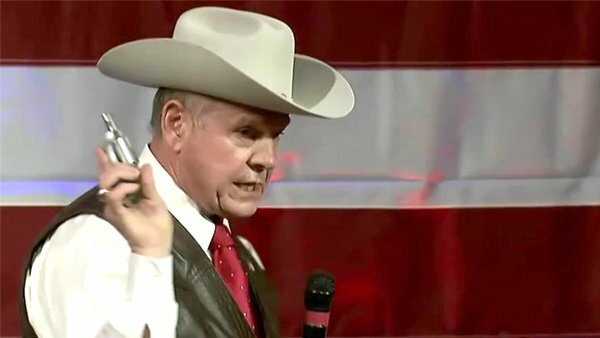 Wearing a white cowboy hat and leather vest at a rally, Roy Moore repeated the conservative Christian themes he has used his entire public career: lock up gays, no to women’s rights… and “I believe in the Second Amendment,” Moore said as he pulled a handgun from his pocket. Another white old male bigot preparing for what??? the next lynching, to shoot liberals? What place does waving a gun in a political forum have in America? Welcome to Republican anarchy. Pre-order my new book, “Letter to Lucy: A Manifesto of Creative Redemption in the Age of Trump, Fascism and Lies” on iBooks. Want more videos, blog posts, and political commentary? Show your support here. Previous Post VIDEO: Trump Is “President,” Tom Petty Is Dead, 58 Killed By Weapons of Mass Destruction and the NRA/Republicans Don’t Care! Next Post Our Nation’s Descent into Madness Via Trump, Fascism and Lies is Killing Us and it Has to Stop. Help Me Stop It. VIDEO: Would Most Americans Approve If General Kelly Punched Trump In the Mouth? Frank has decided to stick the “fascist” label on conservatives in his effort to demonize them. It isn’t accurate, but Frank does not use it because it is accurate. I wonder if a kind of civil war can be avoided. 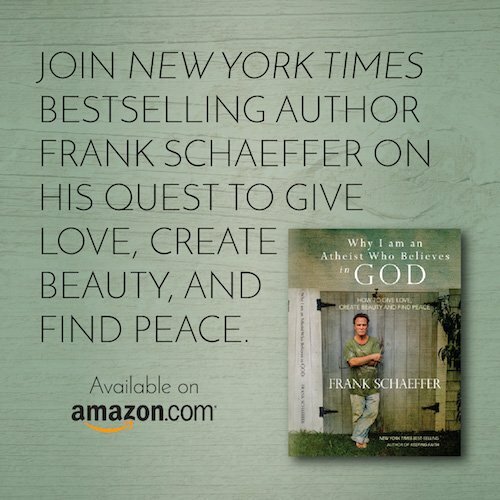 The kind of country Frank wants is not one that I would like to live in, and its clear that the kind of country I want is unacceptable to Schaeffer. There are millions who think like Frank, and millions who think like me. Conflict is going to happen. I think there will be more violence. Certainly more disagreement. I don’t know how bad it will get, but I expect it will get worse than it is now. My money’s on the conservative followers of Jesus because they have more guns and know better how to use them. On the other hand, the progressive followers of Jesus are just so damned sneaky that you can’t be sure about that bet. Gotta grieve the Heart of God though just the same. 1) I wouldn’t go placing any bets on the first paragraph . Suffice it to say there are more of us in the Middle – Left of Center and Left with more ” Lawyers Guns and Money ” .. better knowledge and skills as to how to use them … not to mention us being in the majority whereas those hypocrites claiming to be followers of a Jesus of their own making are becoming more of a distinct minority by the day . PS; GB . re; Civil War . I’d say the chances of avoiding what is rapidly heading towards a Civil war across the land lies in the very hands of those currently doing all they can to create it . That being the ‘ so called ‘ Conservative RNC who at this very moment have the very tool needed ( Amendment 25 Article 4 ) of their own creation back in 1953 to circumvent it by ridding us of the bloviating blatherskite they allowed in the door . TJ, I don’t think Amendment 25 is going to be used. If it isn’t, will that mean the left will declare war? And get a clue Bryson … the US and the World is not Black or White – Left or Right .. with a whole lotta grey area in between of which I proudly make claim to refusing to be propagandized into a mindless sycophant for either side . e.g. For future reference so you’ll know exactly who you’re dealing with .. and assuming you’re able to comprehend what I’m about to reveal . Independent with a capital I .. Reformation Theologian / Philosopher / Apologist as well as a former NRA member and decorated marksman / sharpshooter . And to your great peril we are the majority . Not you . What will this “revolt” look like? If you are the majority, how did Trump win the election? You certainly lift my spirits! Born and raised in Oregon, where carrying is taken for granted. Never bragged about or waved in the air. It has nothing to do with God, fascism, racism or paranoia that the Government wants our guns. No craziness. We don’t think Trump should be near the Oval Office. But that’s just common sense, as is attending College to do our part in making our World a better place. Some attend church; some would rather find communion in the forests. I think it’s a nice balance- live and yet live. After all, that’s what the Word advises, isn’t it? Our fathers fought Nazism in WWII,; and, we’re grateful they could help save America for another generation. Now it’s our turn. No one has ‘done’ a Nation better than ours so far. Thank you Founding Fathers! We certainly will not turn back to Germany. Anyone who knows history can see that’s a lost cause. We the Moderates, Independents of America, the vast middle, must VOTE. We can keep separate the fringes by voting, hand count, if Trump hasn’t dealt with Russian propaganda by 2018.. Let’s vote against extremism; it is the minority. Let’s find Moderates for Congress, who reject that compromise is an evil word! Moderates who can think and speak with considered words and thoughts. They will compromise and start the engine of our government running smoothly again. We just need to take time to vote. Rule out paranoid conspiracy theories. Stop voting for dishonest candidates. Restore decency, integrity and balance. We must vote equity back. Enforce laws that bring American-earned money back to America. Stop the loopholes that allow Corporations to use our benefits, but hoard the earnings in offshore accounts or other Countries. Educate our people in the excesses of greed which prevented the trickle-down theory any chance of success. Let’s not be ignorant. We must not become rigid, set in Party rather than the reality of our history. Trickle-down has been proven to fail every time. Let’s not go backwards. I’ve had my wake up call. I hope most of us have seen through this greedy, alt-right racist in office presently,. It’s voting that will keep us free. 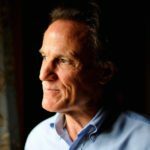 In the meantime, thank you Frank Schaeffer for your action in educating. We must be an educated electorate! 1) Trump won the electoral not the popular vote and that only happened because of the extreme gerrymandering over the past 16 years by the RNC as well as the RNC going out of its way to prevent minorities of all stripes and the poor from voting … not to mention the lowest voter turnout ( per capita ) in US history . Suffice it to say GB y’alls in the bottom 30% .. which makes you a very distinct …. minority . 3) As for what this revolt might look like ? To borrow a pop culture phrase ( TV show ” The Prisoner ” ) ” That would be telling ” Not to mention being in direct contradiction to the edicts of Sun Tzu’s ” the Art of War ” which the majority of us subscribe to . But out of kindness .. take my word for it …. it’ll come from within as well as from the outside . Within as in within the military and federal government . Fact is … many elements are already in place should the courts and congress chose not to take their responsibilities to the country seriously placing Patriotism * over and above Party . 1. Nobody was prevented from voting by the RNC. That’s a liberal myth that you believe. 2. There are lots of people who claim to be Christians but are not. I wish I could change that. Given the choice of Trump or Hellary, I chose Trump. And I made the right choice. I’d do it again, if Hellary was the alternative. 3. There are people who work for the US Government who would like to see Trump gone. Apparently, Trump is not part of the Establishment, and they prefer someone who is. But, I doubt if the US Military would be part of any coup against Trump. Some officers might, but not most others. Second – The RNC with great volition and intent in RNC dominated counties across the land cut back on the number of polling places as well as the hours of operation in order to prevent minorities and the poor from voting . They also went all in on a campaign of intimidation against Hispanic voters under the pretense of preventing voter fraud . Third – Choosing Trump is among the stupidest decisions you’ve ever made based on blind ignorance addled by celebrity while completely ignoring the facts . Though from what I’m reading in your comments I’m guessing you’ll surpass even that before your time on earth is up . Which then begs the question … in light of all the knowledge you make claim to …all your Tin Foil Hat conspiracy insights .. all your attempts at proving yourself an ubermensch how is it you continually miss out on the obvious staring you in the face ? A little too much mono news consumption addled by bigotry and prejudice no doubt fueled by a large dose of racism perhaps ? Or is it simply a little to much of this or that substance .. legal or illegal ? I was not convinced that Hellary would be a better potus than Trump. I knew she wanted a different country than I do. I was not sure how Trump would turn out, but I knew what Hellary would do. Does the US Constitution permit a military coup to overthrow an elected President? If it does, where does it say that? If it doesn’t permit a coup, then a coup would violate the Constitution. Would probably end it. Is that what you want? I see no reason for you and I to debate Christianity. I know that my beliefs are in agreement with the Bible, and I don’t care what you believe, so I don’t see anything to be gained. If Trump is what you claim, then it should be easy to defeat him in the next presidential election. Well said!! Read you blog all the time! Can’t wait to pick up your book. Thanks for speaking out and for being a constant unwavering voice of reason. We need you. Frank, I really want to purchase your new book, but I do not own, or plan to own an iPhone, iPad, etc. I’d like to know when or how I can get the book for Android or Windows platforms.